This is more of a personal blog entry than useful information for the FGC, but feel free to keep reading if you want to hear about my personal thoughts. I live about an hour away from Makuhari Kaihin station, and I needed to arrange for my son to stay with his grandparents, so that meant I was up at 6am (that's normal) and dropped him off at Grandma and Grandpa's at 6:30am so I could get to the venue at 7:40am for the morning meeting to get prepped. If you have never been to a large event in Japan before (Tokyo Game Show, any of the Comic Market events, any general admission large concert / music festival, all sorts of stuff really) you probably aren't prepared for how early you have to be. For example, for TGS, the doors open at 10am. People will start getting to the venue on the first train - sometime at 5am or something, in order to get a good place in line for when general admission starts. The crowds are crazy. So you should always allow plenty of time and just assume that if it is a big event, there will be huge lines. The good news is that usually lines move quickly, people are friendly, and things are organized. That said, keep it in mind, and try to leave yourself lots of time. 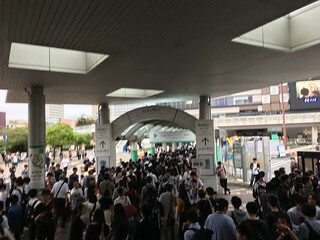 The train station itself can be so busy that at peak time it might take you 20 minutes to get out of the station (which is usually a 4 minute operation). So I tried to make sure I had plenty of time, and as you can see, even at 7:45am, there were a lot of people heading out of the station. Things all went well though, I met up with the other volunteers and Nyanshi, who is running logistics for the event. Nyanshi is a well-known figure within the Japanese FGC, he is a co-founder of Topanga, and involved in organizing and running lots of FGC events. Just like everywhere, there are lots of people that are critical to the health of the FGC working behind the scenes that you don't hear much about, and Nyanshi is one of them. I don't know as much about the production side of things, but everyone knows Camerman and his crew - they were there early setting up as well. Good people, them. At some point, I'd like to sit down and talk to some of these people, but honestly speaking Nyanshi is interviewed by real publications, and has no reason to sit down with a guy on a blog. 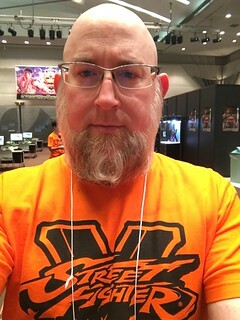 I also would like to write something about Kagechhi (he runs the Fighter's Crossover -Akiba- weekly at Akihabara eSports square) and I could probably swing that if I tried. There is also a crew that does the production for the Japanese streams, and I'd like to learn more about their group. In Japan, almost no tournaments use Smash.gg, usually they will use a whiteboard with hand drawn brackets, or printed out things on paper, or for larger events I have seen some strange server-side updated PDF brackets before. So the first twenty or thirty minutes were spent explaining how to use Smash.gg to the volunteers. Everyone was complaining about the lack of a Japanese localized interface, so get on that Smash team! After that, we walked around setting up the PS4's by de-syncing devices and de-selecting the stages that can't be used for the CPT. Time went by pretty quickly, and before I knew it doors were open. My job was essentially to be a floating translator and troubleshooter. I tried to get some information out on Twitter, particularly trying to help people get to the venue. The first day was held at the International Convention Hall, and there was pretty much no lines to get in the whole day. If you weren't paying attention you could have ended up in a line tens of thousands of people long just to go somewhere that wasn't the venue, so I posted some things on twitter. I had asked Nyanshi if we could get signs in English posted at the train station, or maybe have the Capcom Official twitter account post some stuff in English, but that never worked out. Hopefully everyone was able to get where they needed to go on time. I'm sure people will talk about the mix-up where pools were changed the night before the event. That was apparently a mistake, and the pool changes were only live for a few hours before everything was back to normal. They confirmed that everybody was in the same pool before the change afterwards when they reverted the error. Unfortunately, if you happened to check your pool assignment for the first time during the period where things were mistakenly mixed up, and you didn't follow the Japanese account that was tweeting in Japanese about the issue, and you didn't see some of the other people tweeting in English about it, you very well could have woken up the morning of to find out that you couldn't make your pools. That whole situation was very unfortunate, and I wish I had been able to do more to prevent it, resolve it, or make whole those who were harmed by it. Everyone was working with the best intentions though, and mistakes do happen. So, pools started going. 32 pools in parallel, which is pretty impressive. There was only one setup per pool, but I'm not sure if the numbers work out better if you halve the number of pools so that you can have two setups, or what. There certainly would not have been room for more setups at the venue, but things ran on time the entire day, so I don't think there was a problem with how things were run. In the middle of pools in the morning the place was quite crowded. Momochi had a series of tweets about the 2018 Japan Premiere that was really interesting, and I collected and translated them here if you want some more reading. During pools I wandered around, tried to say hi to all the foreigners I saw - met some nice people, and saw a lot of players that were also out here for EVO Japan. I have to say, all the players that travel the world for the CPT are great in person. None of these people have any reason to be kind and friendly with me, but always have been. I strive to be friendly and welcoming to everyone that I meet and see at a tournament, and particularly to help out overseas visitors, and I'm consistently impressed that in person the FGC is kind and welcoming - unlike what you might guess if you just see the FGC from Twitter or Twitch chat. It was very tight, and hard to walk around to all the pools. I would sometimes stick by the overseas players in case they had some issues or needed someone to interpret, but generally these players know the ropes well, and no major issues came up. I sometimes help the pool runners read the names in the pools if they didn't know the pronunciation but generally I just floated around and tried to help out. Of course, if saw something interesting I might take a picture, and I watched a lot of great matches. For example, I made sure to watch Kichi pa-mu's matches if at all possible - I am a Zangief main and think his Zangief is super exciting. Early on I was watching from behind, and Kagecchi came up and joked that as Staff, I really should not be so obviously supporting one player over another. He was joking a bit, but he is right; I'm representing the Capcom Pro Tour in whatever minor capacity I might have, so I tried very hard the rest of the day not to get excited while watching. I might have cracked a smile or two at other Kichi Pa-mu or Itabashi Zangief matches, but I tried to keep it low-key. I came across both Gafuro and Ryusei, who have had really good performances in the CPT recently. 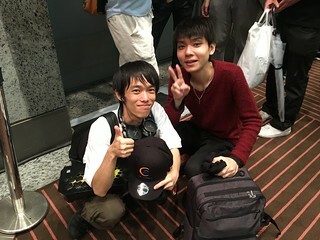 I got a picture of those two - they are both regulars at Fighter's Crossover -Akiba-, which I also usually attend. I asked about taking their picture together, calling them the "young rising stars" and Gafuro protested, saying he's in his 30s and not young anymore. I didn't actually know he was that old, I never would have guessed, but as a 40+ gamer I think I can still call him young. 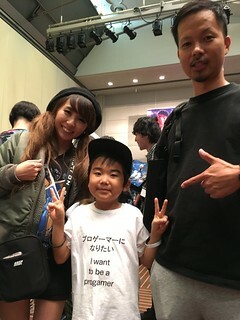 I also came across a very young competitor, 8 year old Kojirou, along with his mom and dad. I was really happy to see a whole family together at the event. Kojirou's dad has a twitter account, and posts about his son sometimes. I recently saw that Kojirou was motivated by Japan Cup, and worked up to Ultra Bronze with his Akuma. 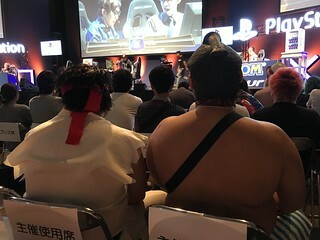 On Monday, his dad tweeted about Kojirou fighting NuckleDu at Studio Sky, and having a great time getting beat up there. I saw a Halloween Juri cosplayer, Oaminyandamaiza, and chatted with her a bit. Later on in the day, another Juri cosplayer (SF4 default costume) showed up, and I really wanted to get a picture of them together, but I didn't have the time. 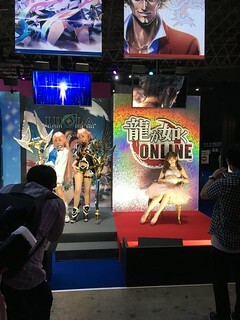 There were a number of cosplayers at TGS, and a few showed up at the event. I really should have taken a picture of my friend Sumitom0 who showed in secretary Karin cosplay, but it slipped my mind. There were some really great matches off stream, and really large crowds around the setups watching. 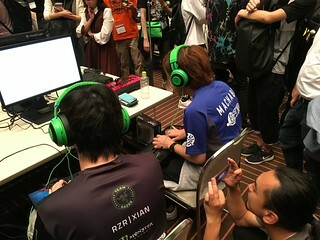 I took one picture of Handsome Orikasa when he was streaming a match between Xian and Machabo (which Machabo won). 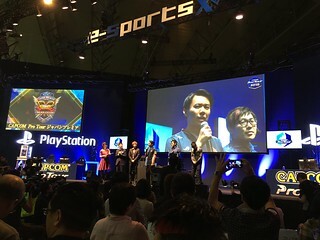 Tokido got knocked down to loser's bracket in the third round by Storm Kubo, Itabashi Zangief lost in a fun match with Justin Wong, Kichi Pa-mu had a great match with Fujimura in the first round on stream, and then beat him in double jeopardy in Loser's Finals of the same pool. I didn't get to see that one, but I could hear it. Justin Wong got knocked down to loser's bracket in the second round by Ryusei, and later on he faced Xiaohai's Cammy with his Menat. He got a lot of use out of popping v-trigger, and then waiting for the Cammy to make an air approach, where he would catch him with a orb, and either trade or get an EX Air Throw out of it. I later saw ZJZ doing the same thing. Sadly, Justin lost to NL in Loser's Final to make it to Top 8. I'm slowly going back and watching other coverage, and in particular it is great to see that the excellent crew at EGX have off stream matches broadcast during breaks. It would be great to see that kind of thing spread. As the day went on, and the contestants were finally whittled down, we were able to use some setups for casual matches. The number of spectators also increased though, and so we kept pulling chairs over to the viewing area so more people could watch. Everything went on time, and all 700+ competitors were narrowed down to the final eight on time. The tournament started at 10am, and ended a bit past 7pm. After everyone left, I helped clean things up, and stayed a bit later to help some friends on the production crew pick up their crazy long cables. We parted ways after dropping off the equipment at the venue for top 8, in Tokyo Game Show proper, and then I headed home, arriving a bit before midnight. If you haven't thanked your local streaming crew, please do. It is a lot of hard work, and people get there early and stay late to bring this entertainment to you. I'm super happy that I can now spend the next few days chipping away at the EGX and other tournament coverage thanks to all the hard working production crews out there. I had been asked originally to work on both Saturday or Sunday, but it turns out they didn't need me on the second day, so I was able to wander around a bit on my own. 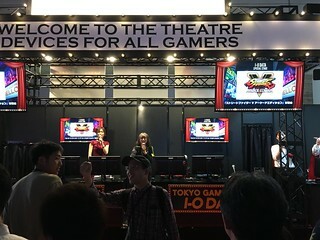 I got there when the venue opened, and walked through the TGS halls. It can take about an hour to walk at a leisurely pace between the hall 1-8, and the Top 8 was going to be in Hall 11, which is another ten or fifteen minutes from Halls 1-8. I snapped a few pictures, but not many because honestly there are people out there with better equipment than I who also know how to take good pictures. You can look up some of their stuff if you are interested. I did take a few pictures of stuff that is interesting to me though. First up, a few cosplayers that I found. 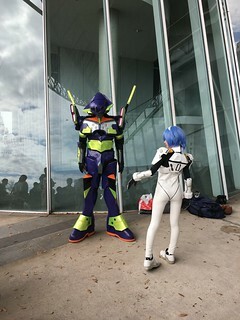 I wanted to take pictures of any Street Fighter themed cosplay that I could find, which explains the Chun-Li, and when I was walking around I saw an Ayanami Rei posing with a Evangelion Mech, which I thought was really cool. I guess I also took a picture of a booth attendant or two. 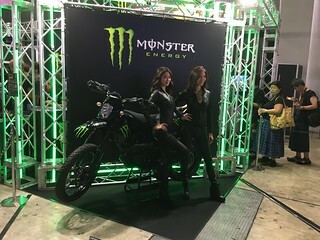 I saw on Twitter Xian had a picture of the two women from the Monster booth posing with the motorcycle, so I did my best imitation of his picture: a poor shot of the ladies by themselves since there was a massive crush of photographers around them. The Sega booth had a whole row of small little photo areas, and I took a picture of the Ryu no Gotoko (Yakuza) Online booth. Last year there was a much larger Yakuza booth with more Kyabakura (women in that style) attendants. 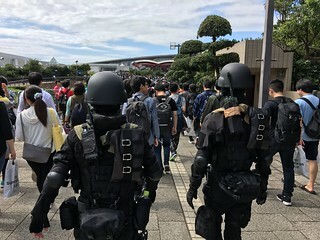 One final interesting cosplay tidbit is when I was making the transition from one hall to another, I ended up behind this pair of uniformed soldier people. I thought they might be from Resident Evil, but I didn't see any of the Umbrella Corp. stuff, so they might have been from something else. It was super cool anyway. There were actually two or three other cosplayers I wanted to meet, but it didn't work one. One person I was able to meet, but didn't take a picture of, was Uta-chan (@chiharaala), a cosplayer who went to Evo with her friend @Akagikuro. Akagikuro wrote a cute manga of the experience that I translated, so I've wanted to meet both of them since then. Uta-chan was working at the DX Racer booth, and was kind enough to stop and chat for a bit, but I didn't want to bother her and ask for a picture. Thinking back on it, that is a bit strange because I bet all the people working the booths took many pictures! 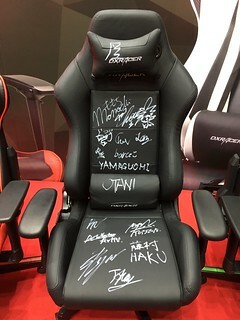 Also, the Shinobism family had an event at the DX Racer booth, and all of them signed a chair or two there (one pictured to the left somewhere). 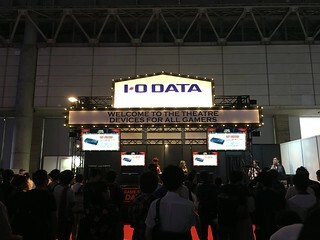 One of the booths I wanted to visit was the IO-Data booth. Kagechhi has been involved with IO-Data at previous TGSs, and this year was no exception. They had a few different "Play against the Pro" sessions - Street Fighter, BBTAG, and SNK Heroines I think. I like Street Fighter, so that is where I headed. 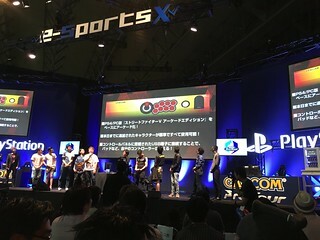 Hatsume, a pro player sponsored by Comp and Father's Back, was taking on challengers. There were lots of people there, so they did a crowd-based Rock, Paper, Scissors match to choose who would play. I thought it was funny that Trashbox, the number one online ranked player in the world, and Top 8 Japan Premiere competitor, was trying to get in on the action. They were pretty much doing FT1 or FT2 based on the LP of the competitor, and Hatsume lost the first match against a Birdie player. They were using the opportunity to demonstrate the GV-HDREC which is a HDMI 1080p 60fps capture device (no host computer needed), so they captured the match on that, and then the commentary (Kagecchi and one other person's whose name I can't recall at the moment) did some analysis. It is a pretty neat little device, and I think The StreetWriter was explaining that they used something similar at EGX to capture off-stream matches for later replay during the break. At any rate, Hatsume was able to beat the others that came out, and there were some fun moments looking back at the replays. By some miracle, I won a round of the RPS, and had a turn. They asked what my LP is and I answered truthfully - I'm at about 1500 right now - although I did get up to about 9000 with my Zangief at one point before I started playing other characters. I'm really pretty bad at the game, but Kagecchi was joking that you can't trust what I say. It's the truth though! I put up a good fight, but didn't come close to winning. I'm glad I made it out to the booth though! 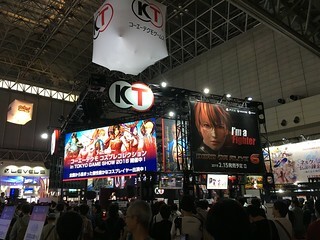 Wandering around the area, I saw that Koei-Tecmo had a booth set up showing off Dead or Alive 6, which looked good, but I wasn't going to wait for an hour to get a game in. 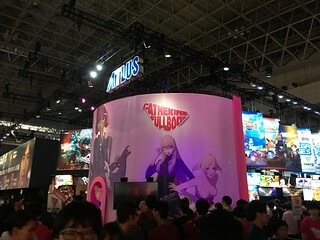 I really like a lot of the stuff that Atlus puts out (I like old school turn based dungeon crawlers / RPGs) and am interested in Catherine Full Body. I've never played that game, but it always looked interesting. Since they are releasing this kind of improved expanded version, and it will be on PS Vita in Japan (I just picked up a Vita this summer) I'll definitely get that an play through it. 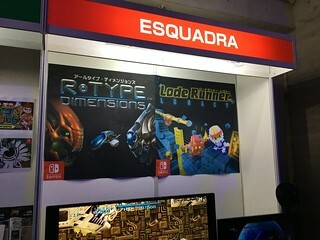 I randomly saw Esquadra's poster for Lode Runner Legacy, which was a real flashback for me. I played a lot of Lode Runner back in 1985 or so on my Apple //e. They also had R-Type, which is another good old game. I love how Japan had some kind of love affair with obscure old games, like the Wizardry series, which went on to much success over here. It's too bad that Wizardry: Tales of the Forsaken Land was the only one that made it over the US. That was a great game though, and I spent a lot of time on it during my PhD. 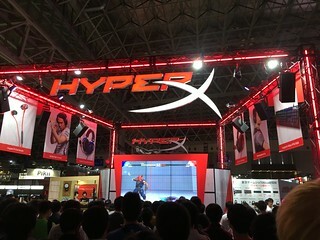 The HyperX booth was very large, and I wasn't able to get close when I walked by. 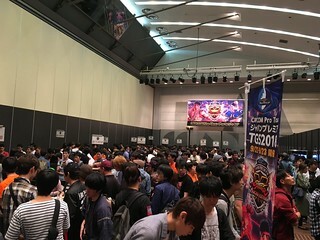 They were running a SFV event with multiple Pro players, and there was a massive crowd there. I would have liked to watch, but I decided to head over to the Blue eSports Stage to get a seat for the end of the Tekken finals (sadly, I only caught the presentation ceremony, I was hoping to see the Grand Final). The main reason I went to TGS on Sunday was to see the Japan Premiere Top 8. I really wanted to see this live, since I've put effort into helping out local tournaments whenever possible (I also had a great time as a volunteer at EVO Japan 2018 as well). So I headed over to the Blue eSports Stage at about noon, and had my conbini-purchased onigiri and water, and got a great seat in the first row open to the public near the center stage. I didn't know anyone around me, which was too bad; I had some (twitter) friends around somewhere, but I didn't organize a meet-up at all. I actually spent my time before the 2:30pm start translating a series of tweets from Momochi about the Saturday Japan Premiere event. I was really happy that I was able to put out a blog post with embedded tweets using just my phone; that was pretty rough. 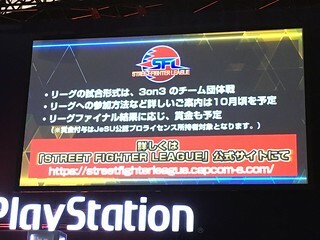 Prior to the Top 8 start, Ono-san announced that in 2019 there would be a three on three team "Street Fighter League", and more details would come in October. I tweeted out a bit of stuff, but I think people watching the stream probably had an advantage with clear shots of the slides. The Top 8 itself was really fun. The house MCs included Golden Bomber's bassist Jun Utahiroba, who I've bumped into many times now. I first ran into him at EVO Japan 2018 where he had a really exciting match as Ken against Cory Bell's Zangief. He's really into Street Fighter as a player, and has been on a lot of the Abema.tv SFV related shows, and goes to tournaments. Since I've done some translation work myself for AbemaTV things, and was even on one of their shows once or twice, we keep running into each other. He was color commentary on the house mic, and was really funny. Another house MC was Anna Tsubaki, who made some references to older street fighters, and seemed to know the lore. The other MC was Tsutomu Sekine, a Japanese comedian. The commentary was by Aru and Hameko, two of my favorite Japanese analysts. The matches were great, and I'm sure everyone saw that crazy Oil King vs. Tokido matchup. Twice, Hameko literally jumped out of his seat. I really wanted to watch the commentary crew and house MCs (Utahiroba was just wild all that time) but I was also fixated on the match itself. Being in the crowd was a lot of fun. I was surrounded by people, and listening to the conversations of the people behind me and to my sides, there were lots of people who didn't know Street Fighter V well. One person had clearly been brought by his friend, who kept explaining different aspects about the neutral game or whatever. The crowd in general seemed to have a good portion of people new to the game, who would ooh and aah at seeing pretty normal moves from characters. I'm not talking about the times when someone does something spectacular or unexpected, or does a tight confirm, people were reacting to stuff that just looked cool. Critical Arts and things like that got good reactions from people who had never seen them before, things like that. I took a quick picture of No Motion, a comedy duo in Japan that have a bit about re-enacting Street Fighter characters. I thought that they came because they were involved and would do something on stage, but it turns out they just like Street Fighter a lot (and might have been scoping out information for new skits). 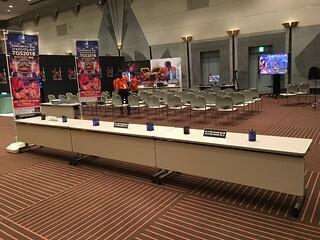 They talked with the head of eSports at Capcom (I didn't catch his name, he passed by in front of me a few times and talked with some other people in the Capcom section). Pretty neat. The crowd was also really cheering for Tokido. He really had an amazing run from the Loser's bracket, with lots of high pressure games. It was really nice to see him take it all. They asked him a few questions about how he felt ("happy") and what he plans to do for the future (he talked about trying to build a more sustainable future for fighting games). After the presentation of the trophies and humorously large vanity "cheque" (large prize pool for Japan! Completely funded by corporate sponsorships!) Ono-san had one more announcement. An Arcade version of SFV:AE with all the DLC characters, and USB ports so you can bring your own controller. There really wasn't much more information than that. He did say something about how they are thinking about what to do with LP, and how that will work, but it seems like it hasn't been decided. They didn't announce anything about hardware (I'm super worried about drivers if it is PC-based) or online play (perhaps utilizing NESiCAxLive2 which would allow player vs player play on different cabinets in different locations.) I'd like to write a blog post up about what I think this means for Japan, and in particular the impact on the local weeklies that sprung up to address the need of a missing SFV Arcade version, so I won't post any speculation here. Overall it was a really fun experience - and great to see the Top 8 in person. If you ever get the chance, definitely volunteer to help out local tournaments. Organizers need people to run pools and take care of other tasks, and if you are like me and aren't going to make it out of pools, helping out at the tournament can be a great way to contribute.